Airsource are delighted to announce that Optiscan is now available for purchase. 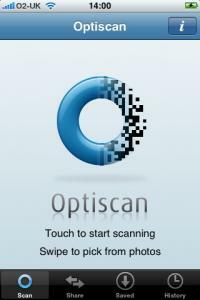 Optiscan is a professional quality QR Code tool, featuring by far the fastest scanner available on the App Store. Optiscan automatically locates and scans QR codes in the camera viewfinder. No more failed scans or blurry barcodes. Scans well from paper, monitors and other device screens. Scan a wide variety of QR code data formats, including locations, email addresses and phone numbers. Save specific QR codes for quick sharing -- perfect for sharing your business card. Want to scan or generate codes in French? Japanese? No problem. Optiscan supports UTF-8, ISO-8859, and Shift-JIS. Safari lets you save images (tap and hold the image) to the photo gallery - and Optiscan will decode them for you. Optiscan runs without a network connection, and keeps your data private. Why put up with anything less? Optiscan is available right now from the AppStore, priced at $4.99, £2.99, or €3.99 If you'd like to review the application, then promotional iTunes codes are available. Please email, mentioning the website where your review will be posted.